Our predictions regard Hungary accepting Australia on their way to Russia for World Cup 2018 football battles. It will be the final chance for the Aussies to test everything prior to the start. The venue of this International Friendly match to be the Hungarian Groupama Arena in Budapest. You are about to know what we are going to predict for it. The Magyars have not too much to play for and more likely they are looking towards their summer vacations. Actually the most of the footballers playing abroad are already on the rest and weren't called here. There are some injuries in the Hungarian squad as well. Important defenders Barnabás Bese, Mihály Korhut, midfielder Zoltán Gera, the vice-captain are all out. Also absent are the USA-based players like Zoltán Stieber, Nemanja Nikolić, Krisztián Németh, and Dániel Sallói (mostly forwards) who are still busy with the MLS ongoing season. Hungary miss the World Cup 2018 and seem not to especially bother about the friendlies which have held after the qualification campaign. The Georges Leekens men have been beaten even by the likes of Luxembourg and Kazakhstan. There are doubts about how seriously Australia would be accepted by Hungary as well in the upcoming fixture. The Socceroos led by the coach Bert van Marwijk who qualified for the World Cup 2018 with... Saudi Arabia. While Australia were promoted there under command of Ange Postecoglou who suddenly resigned just after that. However, the Dutch manager carefully kept the most of the Australian squad of his predecessor. Relatively many changes came only at the back. Somehow van Marwijk didn't like the English-based defenders Bailey Wright (23 caps), Ryan McGowan (20), Brad Smith (19), dropping them out of the final lineup of 23. 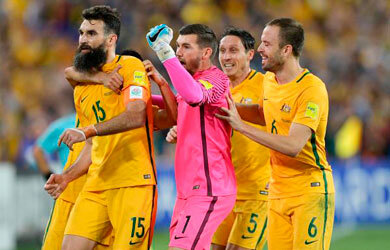 Despite Australia's impressive 4:0 walk over Czechs on June 1 and a 0:0 stalemate against Colombia on March 27, there are issues in defensive work of the Antipodes. Which are no surprise considering the facts given above. Norway, - hardly the best attacking football nation - shed a lot of light on it thrashing 4:1 the visitors from Sahul on March. More relaxed Hungary should exploit those weaknesses of the guests, according to our main forecast. Most likely Australia will find the net too. Logically, it has a lot of sense to bet on "Both teams to score" @2.00 with Sbobet (if you are not their customer yet, sign up now and get a €200 bonus T&C apply). As for the outcome prophecy, let it be a tie.